The retail industry has been ailing, and it’s getting harder and harder to find a way to survive. Shoppers have continued to abandon stores like Macy’s, Banana Republic, and J. Crew, only helping to throw the mall industry into a wilder tailspin. However, there’s a category that’s thriving: beauty and drug. In a recent note to clients, consulting firm Conlumino called out beauty and drug as the “star performer for the month” of May, while apparel sales fell. Millennials, as it stands, love spending money on makeup. When Jim Cramer cited three core categories that they will spend money on, it cracked the list. The other two categories were cell phones and Uber rides. And when Goldman Sachs and Teen Vogue polled fashion-forward women ages 13 to 29 to find out their favourite brands, MAC Cosmetics came out on top — Sephora, Urban Decay, and Make Up For Ever all cracked the top ten, too. But it’s not just millennials. And the strength of Sephora and Ulta have underscored the weaknesses in places like Macy’s, which — with its haphazard stores and bargain bin semblance — have failed to keep consumers coming back. “As the stores are so poor, Macy’s customer traffic is down and people don’t visit as much as they used to. This impacts on all sectors, including beauty. That said, specialists like Ulta and Sephora have wider ranges, very strong e-commerce offerings, and better in store experiences,” Saunders wrote. 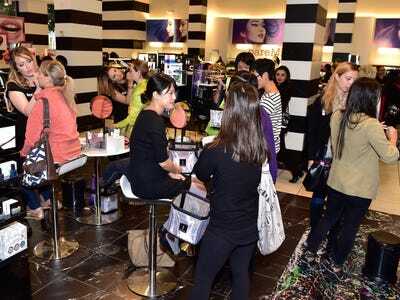 Sephora, which is owned by fashion powerhouse LMH, also has a very strong loyalty program which keeps consumers coming back to go shopping , and it’s redefined the way people shop for this category — so it makes sense that one particular department store has incorporated Sephora stores inside its own preexisting stores. “In short, while department stores used to be a key destination for beauty many of the mainstream players have been outsmarted by specialists — which one of the reasons JCPenney has integrated Sephora into many of its stores!” He wrote. Another reason that consumers might be enamoured with these stores is that they sell experiences — something millennials love. Sephora offers classes and in-store makeovers, and Ulta even has salons. And the numbers tell all: in its most recent quarter, Ulta’s comparable sales rose an impressive 15.2%. In fiscal 2015, LVMH said Sephora’s category, Selective Retailing, saw revenue grow 18%. All of this starkly contrasts stores like Macy’s and Nordstrom’s negative comparable sales.